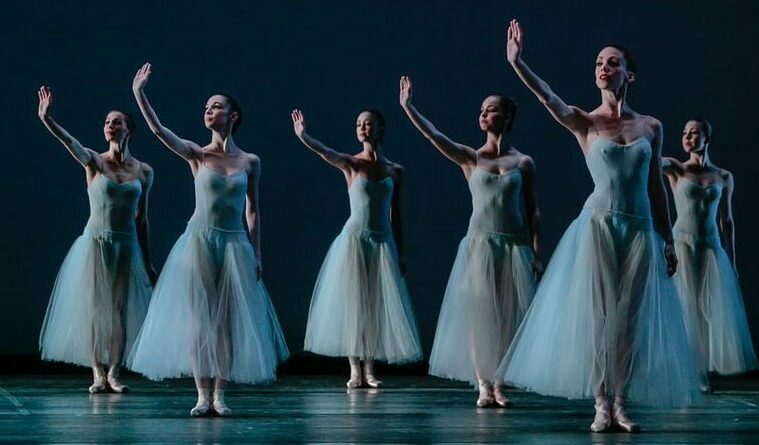 Artists of Houston Ballet in George Balanchine’s Serenade. DALLAS—Jonah Bokaer, Daniel Arsham and Pharrell Williams open the Dallas Symphony Orchestra’s Nancy A. Hasher and David J. Haemisegger Family Soluna International Music & Arts Festival with the world premiere of Rules of the Game,with choreography by Bokaer, visuals by Arsham and music by Williams, played live by the DSO and arranged by David Campbell, on May 17 at Winspear Opera House. The evening also includes two of Bokaer’s previous works with Arsham: Why Patterns and RECESS. 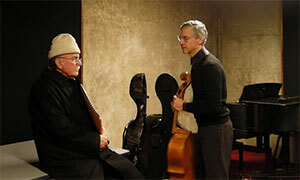 The Soluna Festival runs though June 5 and features many artistic collaborations. AUSTIN — Transformation through erasure: That’s what Ciudad Juárez native Miguel A. Aragón seeks in his work. In an attempt to come to grips with the violence that has become commonplace in his home, Aragón takes images he sees in the media and works backwards, reducing the content in an effort to explore how we perceive and remember. 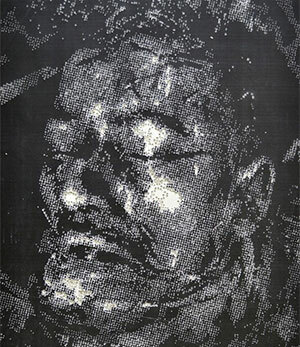 See a selection of his works in De la Complicidad con la Agresión, on view at Austin’s Flatbed Press and Gallery through June 4. Miguel A. Aragón, Retrato, 2016. DALLAS/FORT WORTH—Texas Ballet Theater closes its season with First Looks, featuring the world premiere of Val Caniparoli’s Without Borders, Ohad Naharin’s masterwork Minus 16 and Glen Tetley’s soaring Voluntaries, May 6-7 at Dallas City Performance Hall and May 27-28 at Bass Performance Hall in Fort Worth. The performance of Naharin’s Minus 16 represents the first time at Texas company has performed his work. Texas Ballet Theater dancers Andre Silva, Alexander Kotelenets, Joamanuel Velazquez and Erez Zohar, with Shane Howell, répétiteur for Ohad Naharin, rehearsing Naharin’s Minus 16. 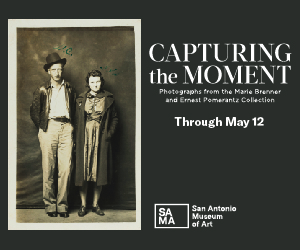 SAN ANTONIO—In Shadowy and Still, on view at Sala Diaz through June 4th, Texas-based artist Sterling Allen explores the invasive, or perhaps not so invasive nature of the camera, questioning how different the image captured by the camera and the viewer’s experience of an object might be. Through sculpture, photography, and site-specific interventions in the Sala Diaz space, Allen seeks to coerce viewers into contemplating the same. 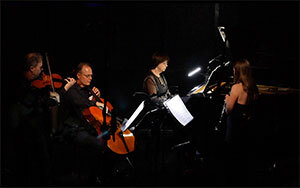 SAN ANTONIO —SOLI Chamber Ensemble closes it season with Under the Ligurian Sun, works by Aaron J. Kernis, Pierre Jalbert, Robert X. Rodríguez and Daniel Asia, as well popular music from Italy and around the world, May 16 at the Tobin Center, May 17 at Trinity University. HOUSTON – From his early days in a punk band to his later years as a critic of the systems of a bureaucratic art world, Houston-based artist Mark Flood has always positioned himself in opposition. Irreverent and self deprecating, Flood has carved out a unique space for his collage, painting, and sculpture work outside of the “mainstream” while forging an alternative definition of art world success. Through August 7, the Contemporary Art Museum of Houston offers a survey of his three (plus) decades of work. 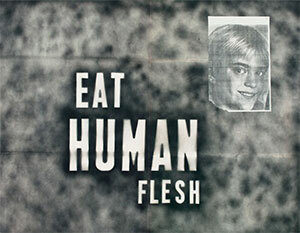 Mark Flood, EAT HUMAN FLESH, 1989. 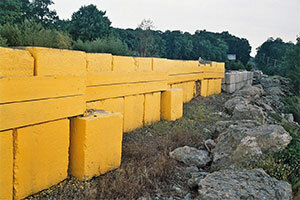 Courtesy the artist, Peres Projects, Berlin, and Stuart Shave/Modern Art, London. MARFA—Marfa Live Arts and Fieldwork: Marfa present composer Alvin Lucier and cellist Charles Curtis in Marfa Sounding, a series of site-specific performances, sound installations, and conversations exploring the intersection of music and the visual arts in the development of minimalism, curated by Jennifer Burris Staton, May 26-29 at several Marfa sites. 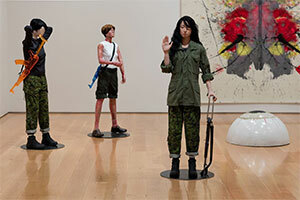 DALLAS— Through July 17 Nasher Sculpture Center visitors have a chance to enter the surrealistic world of Mai-Thu Perret. As another entry in the always interesting Sightings series curated by the museum, Perret has created a theatrical installation of female figures in the downstairs gallery. Inspired by her career-long interest in feminism, utopia, and the aesthetics of the avant-garde as well as her readings about the real-life all-female militia that assists in protecting the newly established community Syrian Kurds in Rojava, Perret has created an installation that is as ambiguous as it is realistic. Sightings: Mai-Thu Perret, March 12–July 17, 2016 Nasher Sculpture Center. Photo: Kevin Todora, courtesy Nasher Sculpture Center. HOUSTON—Houston Ballet’s Spring Mixed Rep features George Balanchine’s romantic masterpiece Serenade, Kenneth MacMillian’s Gloria, a haunting elegy for those who perished in World War I, and Alexander Ekman’s Cacti, May 25-June 5 at Wortham Center. And Miller Outdoor Theatre presents Houston Ballet in a season sampler, May 6-8. Houston Ballet’s Mireille Hassenboehler and Katharine Precourt in Balachine’s Serenade. DALLAS—Women have undergone an interesting evolution in how their work is perceived by what was once the male-dominated art world and we’ve emerged in the 21st century at an interesting place: often still “othering” the female in our relentless celebration of her. Erin Stafford’s work is purely of her time, unapologetically feminine in its references to the domestic and the decorative, yet wholly ambiguous in its overt surreality. In Misbehaving, the first solo exhibition of Stafford’s at Kirk Hopper Fine Art, Stafford has created sculptural works, painting, and installation which allude to the interior spaces of the domestic through an interesting combination of kitsch, surrealism, and sentimentality. 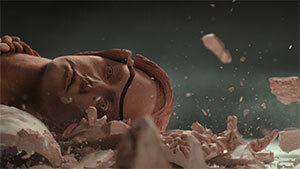 See the work through May 21. 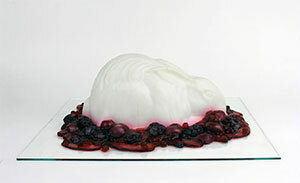 Erin Stafford, Haute Cuisine from Bygone Eras (Berry), 2015 Dimensions variable Soap and glass panel.